Greg Romain the President, Director, and CEO of Gowest Gold sits down with Maurice Jackson of Proven and Probable to discuss the value proposition of the becoming the next Gold Producer in Timmins on their flagship project the Bradshaw Deposit. 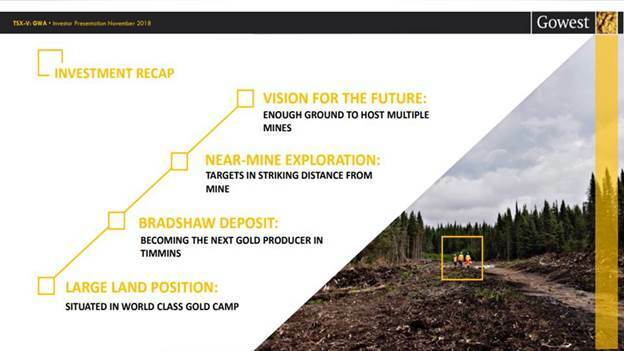 In this interview we will address the Gowest Gold’s provide a historical reference on the Timmins Region, the value proposition of the Bradshaw Deposit, strategic goals, management team, capital structure, and PFS. For current and prospective shareholders there are details enclosed as well for financing opportunity for accredited investors. Greg Romain, CEO of Gowest Gold, sits down with Maurice Jackson of Proven and Probable to discuss his company’s aim of being the next gold producer in Canada’s Timmins gold camp. Maurice Jackson: Joining us today is Greg Romain, the president, CEO and director of Gowest Gold Ltd. (GWA:TSX.V), which is focused on becoming the newest gold producer in Timmins. For someone new to the story, who is Gowest Gold, and what is the thesis you’re attempting to prove? 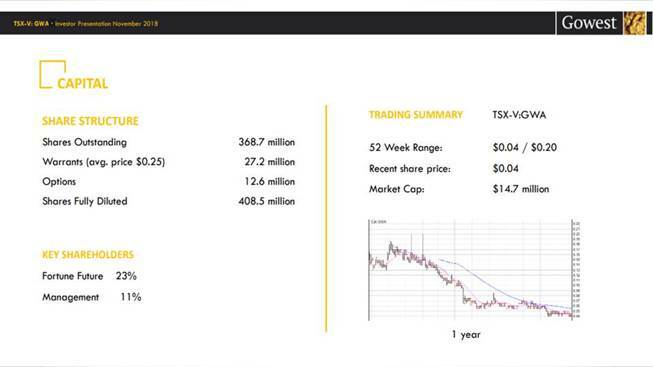 Greg Romain: Gowest Gold is a junior exploration company listed on the Toronto Venture Exchange. 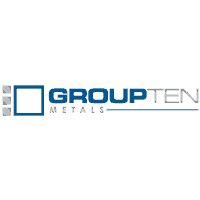 We are focused on our North Timmins Gold Project, and in that part of that North Timmins Gold Project, we own 100% of the Bradshaw Gold Deposit, which we are currently in a bulk sample and moving towards full production. 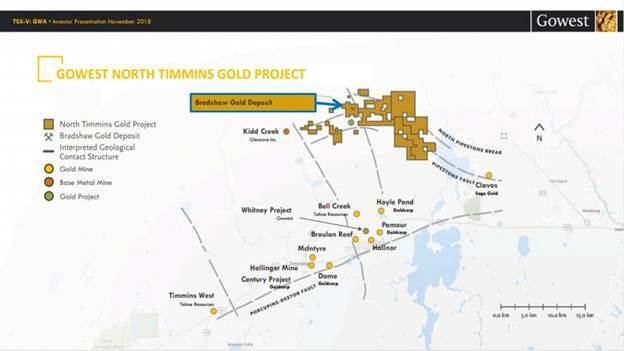 The Bradshaw is turning out, and we hope, to be the next, newest gold mine in the Timmins Camp not next to an existing headframe built in the last 25 years. Maurice Jackson: Mr. Romain, please provide us with some historical mining context on the Timmins region, so we may have a better understanding on why Gowest Gold has focused their efforts specifically in Timmins. Greg Romain: I was born and raised in Timmins, and so I view Timmins as a great mining jurisdiction. In the last 100 years, there has been over 70 million ounces of gold that’s been produced in the camp, and there are a number of deposits that are currently being mined. 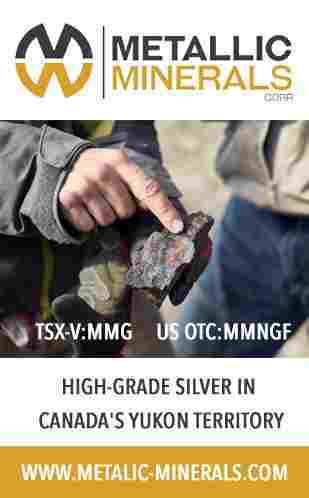 For example, you’ve got Goldcorp that is mining up in Timmins, as well as Tahoe, its Lake Shore deposit, and a few other smaller ones that are being mined by other various companies. We and, more specifically, my father-in-law, initially made the discovery. 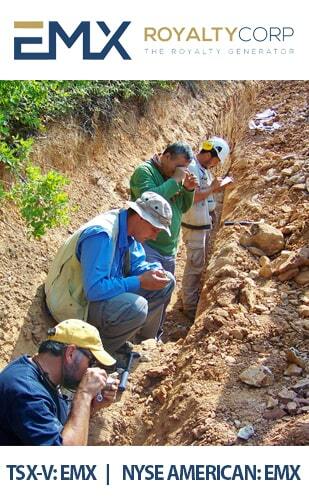 He was on discovery teams of other gold mines in the past and identified this deposit, which we are now hoping to bring into production. 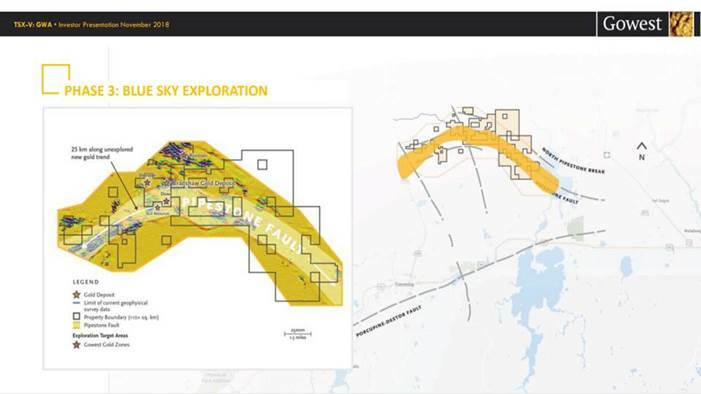 Maurice Jackson: Gregory, now that we have covered the historical mining context on the Timmins region, please introduce us to your flagship project, Gowest North Timmins Gold Project and the value proposition it presents to prospective shareholders. Greg Romain: The Bradshaw Deposit is located north of the city of Timmins and east of the Kidd Creek Mine. The Kidd Creek Mine is the deepest base metal mine in the world, which is owned by Glencore. Most of the mining companies in the Timmins Camp are situated along what is known as the Porcupine-Destor Fault. We are located north on the Pipestone Fault. The Pipestone Fault is the same time period and event as the Porcupine-Destor. When Kidd was discovered back in the 1960s, they flew Airmag surveys and did some ground drilling looking for more base metals. They came across gold but couldn’t follow it. It was in the early 2000s that the founder of Gowest got his hands on a governmental and geophysics survey, pieced things together, and came up with the initial half-a-million-ounce resource in 2006. It’s very prospective area that holds a lot of opportunity. Gowest picked up a large land package along the Pipestone Fault. We now own approximately 25 kilometers along the Pipestone Fault, and it still has been underexplored. When I took over the company, the focus was to develop the Bradshaw into an operating mine, generate cash flow, and use that to continue the exploration. 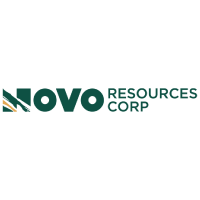 We have a number of other zones near Bradshaw that we have done a little bit of drilling and have identified gold and eventually want to turn those into resources as well. So, there’s a great opportunity there. Bradshaw itself, the mine site is close to the city of Timmins, therefore we already have good infrastructure, great knowledge of the people, great working relationship with the First Nations because they’ve been working with mining companies for a long time. So, all in all, the Timmins area is one of the best areas in my view and in terms of mining and opportunities that present themselves. Maurice Jackson: Gregory, I believe you’re being a little conservative here with us. 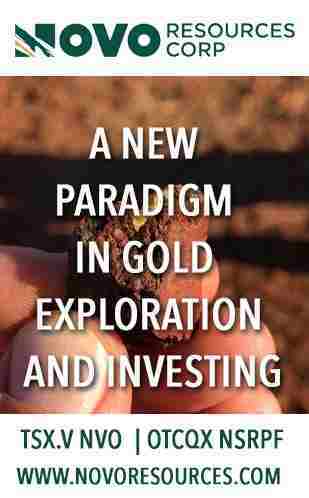 Gowest Gold has a multi-million-ounce potential here. Talk to us a little bit more about the resource. 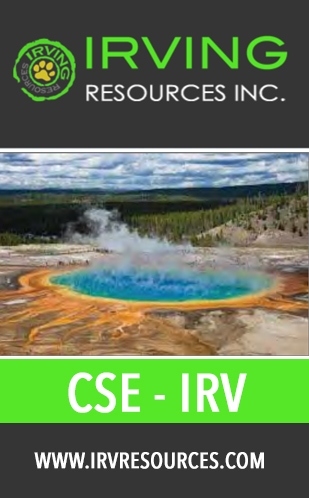 Greg Romain: The resource total is about 1.2 million ounces, and if you break that down, you’re looking at about 450,000 to 500,000 ounces of Indicated ounces of about 6 grams resource. 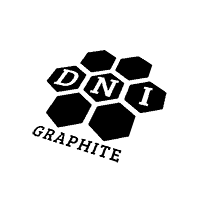 In that, you’ve got a reserve of about 277,000 ounces at about 5 grams grade of fully diluted, and that resource is an 800-meter strike length down to about 500 meters. And then, from 500 meters down to 800 meters, you’ve got about 800,000 ounces of Inferred ounces at about 6 grams as well. It’s open along strike, and it’s open along depth. It’s turning out to be one of the longest strikes ever found in the Timmins Camp. 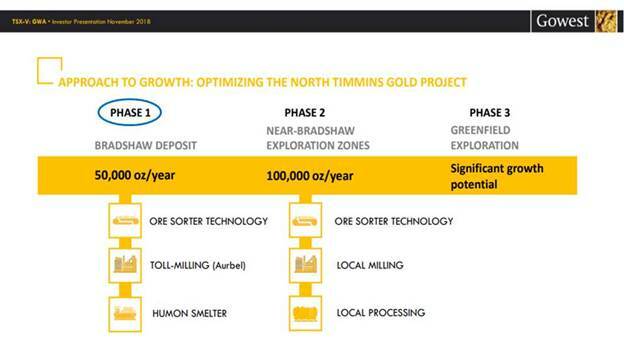 Maurice Jackson: Gowest Gold has outlined a three-phase approach to growth on how it plans to optimize the North Timmins Gold Project. Please share the strategy with us. Greg Romain: Phase One we are going to focus on the Bradshaw. We are using existing capacity in the Timmins Camp to process. If I step back a moment, the ore at Bradshaw is our single-pyrite refractory gold. 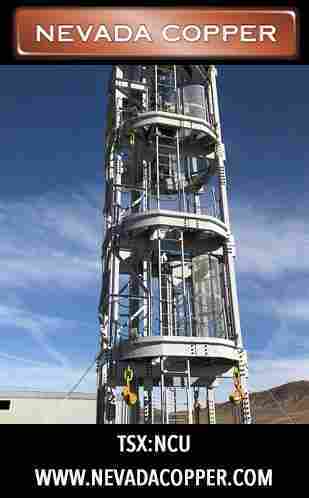 It’s a similar type of gold structure that is found, for example, at Barrick and Newmont in Nevada. Placer Dome, Red Lake operation, part of their deposit is refractory in nature as well. 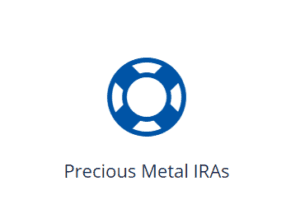 Once we mill, we’ll produce a concentrate, and we’ll ship that concentrate to a third party for processing. To accomplish this our goal is to get Bradshaw into production, use existing infrastructure, and get the project up and running. 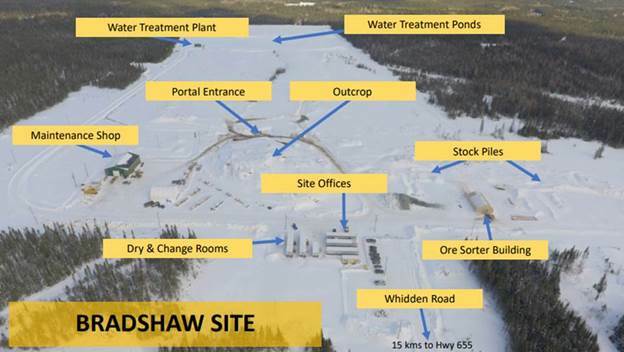 At the same time, continue to expand the Bradshaw to get into multi-million-ounce resource and then look at building our own infrastructure or acquiring infrastructure within the camp. This way, we’ll realize additional savings and more to the bottom line. The second phase is to continue the growth of the Bradshaw Deposit but also other existing zones in our portfolio that are within a kilometer of Bradshaw, which are the Sheridan, Roussain and Dowe zones. The Sheridan zone is to the west. Roussain zone’s to the north, and the Dowe zone is just to the south of Bradshaw. All of these zones have had some preliminary drilling done on them, but they’ve never been turned into a resource. As you can appreciate, cash is hard to raise, and we treat dollars like manhole covers. And again, we try to focus and do one thing right and then move from that center point. 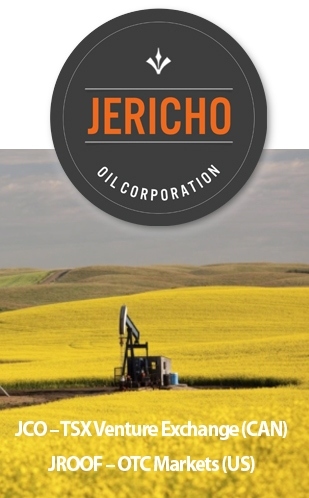 The second phase would be to take Bradshaw, which our PFS indicates an average when we are in full production of approximately 50,000 ounces a year, but we are already have plans to increase that to 100,000 ounces per year. In the PFS, we had a single ramp, going into the sinter of the deposit. We have plans to ramp off the main ramp and then get a number of more faces moving so that way we can get our production up to 100,000 ounces per year. And at the same time, we have a third phase is outside of the Bradshaw in the zones that are within the kilometer. As I mentioned earlier, we have got a 110-square-kilometer land package. We have a large land package on this underexplored area of the camp that we have done quite a bit of geophysics work, soil sampling, and there are a lot of correlations between what we see outside of I call it the Bradshaw Project area with Bradshaw. We are pretty excited about what we have and pretty keen on developing it. But again, our view is to grow it internally and move outwards as opposed to try to be the biggest and the best for everybody. We are going to do it one step at a time. Maurice Jackson: Mr. Romain, walk us through the Bradshaw site. Greg Romain: At the Bradshaw site we have offices, dry and change rooms. Gowest Gold has about 30,000 tons of mixed development ore sitting on site. 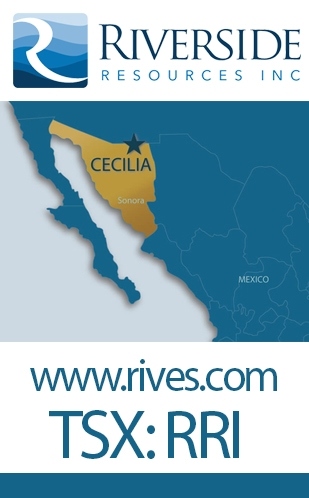 We have completed over 2,000 meters of underground development, and our water treatment plant is up and running. 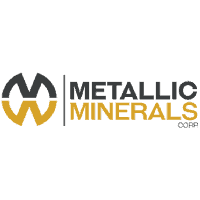 Although we are just moving through the bulk sample phase, and we have permits, we are well along the way of applying for our permits to continue mining. We have designed the mine footprint to really be set up for full mining production, so it isn’t like we built a small little footprint just for a 30,000-ton bulk sample, and then we have to start all over again. We have been doing things in parallel, which is how I’ve always run businesses. Maurice Jackson: Let’s discuss the bulk sample program and moving towards production. Gowest has accomplished some milestones this year on the Bradshaw Project. What can you share with us regarding the underground development? 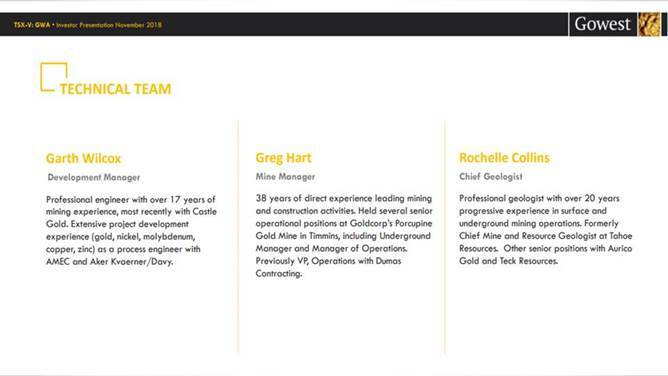 Greg Romain: Gowest Gold has completed over 2,000 meters of underground development this year. This includes commissioning of the main ramp and a portal. The portal and the ramp are sufficient to bring us into future, full production mining. We have developed the three levels so far at 30, 45 and 60-meter levels, and we have initiated silling, and really, we are right at the stopes now. So, we have got about 30,000 tons of mixed-development ore on surface, and then we are ready to start mining. The development follows the gold structures, and all the work that we have done to date shows great continuity and great opportunities. It’s one thing to be an explorer on surface drilling holes, but once you’re underground, you really get to see it. We have been able to confirm and enhance our geological model and what we see. We believe there’s a lot more structures that we’ll be able to prove out, and so far on the project, the most important thing, there’s been no injuries at the project to date. Everything has gone really well on the underground construction. Maurice Jackson: What steps have you taken this year on preparing for production? Greg Romain: In preparing for production, our water treatment plant is fully operational, and the discharge is environmentally compliant. That’s a big step. Also, we have introduced ore sorting and X-ray ore sorting and laser sorting, and this will enhance our reserve grade. 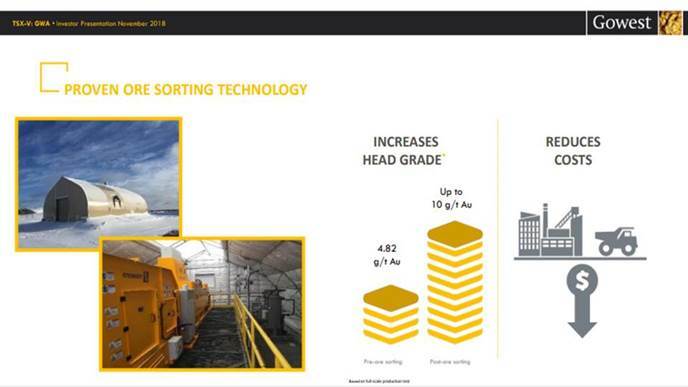 We are going to reject plus 50% of the waste rock, effectively doubling the grade of the ore from 5 grams up to 10 grams that will be delivered to the mill. As one can appreciate, while we are still chasing the vein and minimizing dilution at the mining phase, it allows us to reject the waste before it hits the mill. So, there’s a big cost savings because we are going to be shipping this ore to a third party for processing, so we are going to be able to ship less. Also, our cost will be less in the mill because we are not going to be processing the waste material. So, that is very important. We continue to do metallurgical test work. And so far, our tests have showed that we get 97% recoveries, and we continue to optimize the processing cost on the flotation circuit. One of the biggest things in underground mine operation is ground stability, and we have been able to demonstrate stable and competent ground conditions in both the ore and waste areas. That’s very, very important. We are going to be able to revise our geological model sharply to expand the mineralized area of potential. 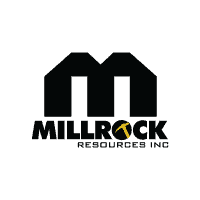 We see lots of opportunities to expand the mineralization envelopes as we move forward. In terms of the concentrate, we are going to produce a high-grade concentrate ranging in-between 2 and 3 ounces per ton. That concentrate will be shipped to a third party. 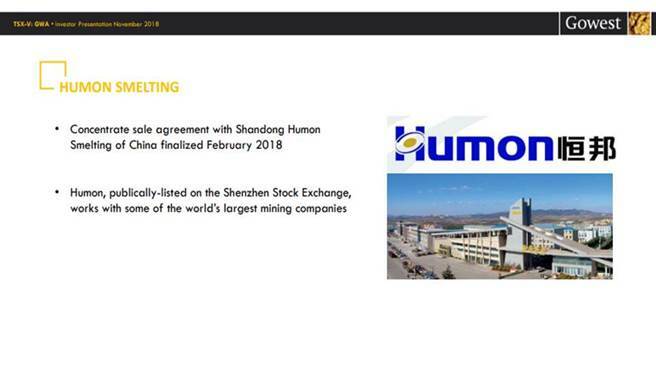 Currently, we have an agreement with a company called Humon, which has a large smelting operation in China. Gowest Gold went out on pricing to a number of different groups both in the Americas, outside of the Americas, and that was the group that gave us the best deal at this point. 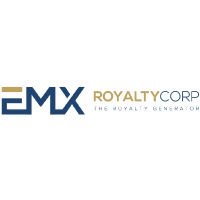 Recently, we signed a 12 million agreement with QMX to use its Aurbel Mill to process the ore into a high-grade gold concentrate. Maurice Jackson: Regarding the processing and milling agreement, have you come across any challenges that were unforeseen? Greg Romain: The processing of the concentrate was fairly straightforward. There were no issues. Regarding the mill, we ran into a challenge and this is where current and prospective shareholders may be looking at the Gowest share price wondering “Well, what happened?” Gowest signed a definitive agreement at the end of 2017 with a company called Northern Sun to acquire 50% of the Redstone Mill in Timmins. The Redstone Mill was the perfect mill for Gowest, providing float cells and it could produce a concentrate. We signed the definitive agreement working towards getting Ontario government consent for the Redstone to process third-party ore. In April of this year, we were notified by Northern Sun that its parent company out of China had a re-org and decided that it wanted to terminate the ownership agreement, the Gowest acquiring 50%. And furthermore, it decided it didn’t even want to process our ore, period, even though Northern Sun had received written permission, which we had seen a copy from the Ministry of the Environment to Process. This led us to spend months of negotiating to find a new mill, which we successfully ended up doing. Now, we are in the throes of a financing, but that was the major issue that we faced in the milling side of things. Our view was try to minimize capital spent to get the project up and running. But as you can imagine, you’re saving on capital, but sometimes some things are outside of your control. And unfortunately, we ended up running into a bit of a jam. When we signed the 50% definitive agreement, in the agreement, it said that we couldn’t solicit anybody else. So, for a period of a number of months, I was working with the group that we signed the 50% definitive agreement, and as such was precluded from talking to anybody. But once it ended, then we moved on to other opportunities. So, that really impacted us from a timeline and funding perspective. 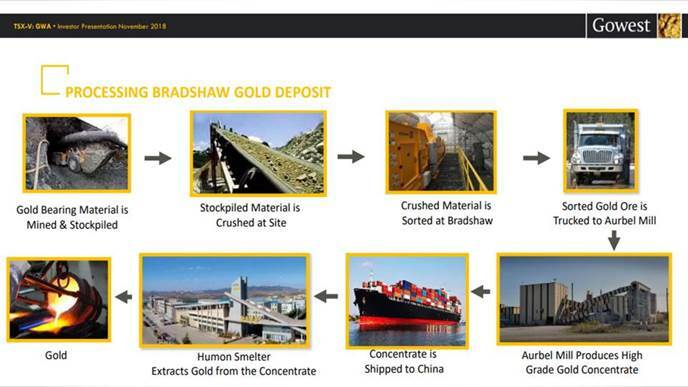 Maurice Jackson: Walk us through the processing of the Bradshaw Gold Deposit. Greg Romain: We are going to mine the ore from underground, bring it up. We are going to crush it at site. We are going to crush it down to about an inch, 3/4 of an inch, and then from there, we are going to run the material through the laser X-ray sorter. The sorter will reject up to 50% of the waste rock. From there, the sorted gold ore will be trucked to the Aurbel Mill, and then from the Aurbel Mill, we’ll produce a high-grade concentrate of 2 to 3 ounces per ton. And then, from there, it will be shipped from the Port of Montreal to China. The agreement we have set up with the folks at the Humon Smelter is we get paid 90% of the value of the shipment once it’s on the boat in the Port of Montreal, and then the balance will be remedied once it hits China. Maurice Jackson: What kind of time allowance has the company established on the evolution of the Bradshaw Project? Greg Romain: I joined the company in mid-2008, but I wasn’t doing what I would say is true work until 2009, and the reasoning was that the Bradshaw Deposit was owned 50% by two private companies. So, I spent the better part of 2008 and the beginning of 2009 pulling the private owners’ half into Gowest, as well as the surrounding land. At the end of 2009, we raised approximately $6 million, so the true work started in 2010. 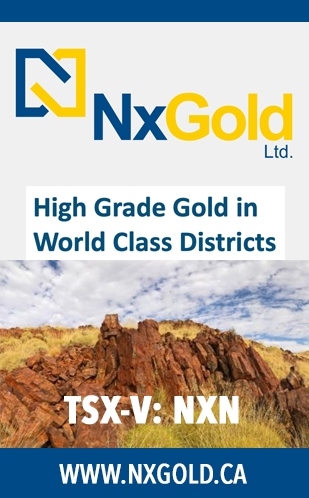 Currently, Gowest Gold expects to have the bulk sample completed towards the end of mid-2019, subject to financing, and then be into commercial production the beginning of 2020. 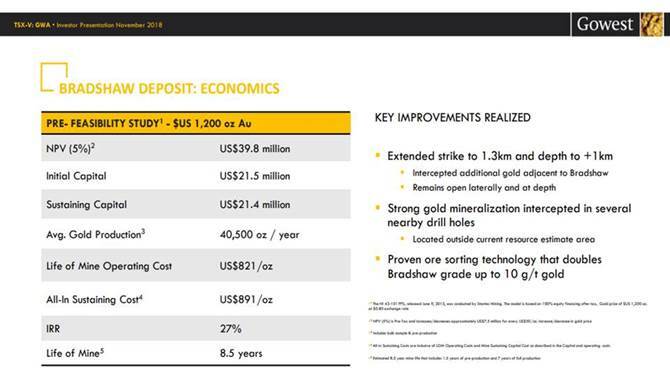 As well as some of the catalysts not only growing the Bradshaw, but we also want to start spending some money, some time, and effort on the Sheridan and the Roussain zones to get that into resource status as well and add to our ounces. Maurice Jackson: We have covered phase one. Let’s move on to phase two, which is doubling your production rate to 100,000 per year. 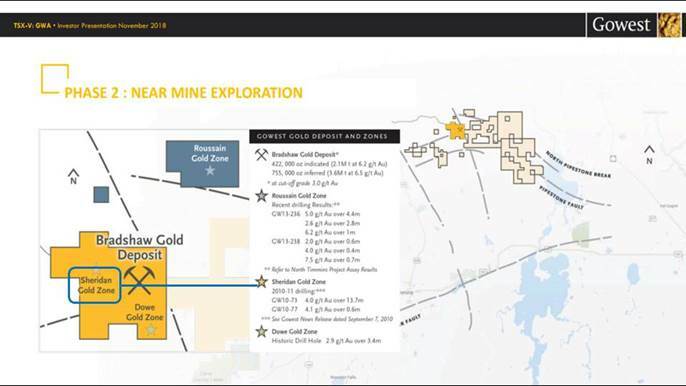 Gowest Gold has three additional gold zones. Please provide us with some background on each of these zones. Greg Romain: The first zone is the Sheridan zone, which is located approximately one kilometer east of the Bradshaw. We drilled several holes back in 2013. The Sheridan zone was owned by a private company called New Texmont. The owner at the time, who has since passed, indicated that they had pulled out a couple thousand ounces of gold there. I can’t prove or disprove that. But what we did do is we drilled a few holes in 2013, and we got some pretty good grades, grades that we have reported anywhere between 5 to 6 grams over 4 with anywhere between 1 and 4.5 meters. So, there were some good grades, and it was all shallow drilling, less than a couple hundred meters. Therefore, this is one area we want to go back to because that’s about less than a kilometer from Bradshaw. The current resource is about 800-, 900-meter strike length. But we have drilled 1.3 kilometers on that strike length, and we have done some big stepouts that are not included in the current resource. And, as well, at depth at Bradshaw, we have drilled 1,200 meters and still found mineralization. North of the Bradshaw, we have the Roussain zone. It’s an old American Barrick property that we picked up from Goldcorp several years ago. We drilled a few holes up there as well and hit 4-5 grams. One hole was 4 grams over 13 meters, so again, only a couple holes, again shallow drilling, but we see that there’s opportunities up there as well to hit that area. And then, south of us, we have got the Dowe zone, and there’s some historical drilling, again, in around the 3–4 gram range, again, very shallow drilling, less than 200 meters. We drilled some of our largest grades underground this year at the Bradshaw, and we think that that’s going to provide us with a great opportunity to enhance the value. We intersected, and this is all public, gold values of the project 150 grams of gold in a new zone outside the current resource. We have also identified a number of new gold zones in the bulk sample area that we found once we were underground. And also, we have gone through some of the historical core, and because we are using the X-ray sorter, we also own a hand-held X-ray gun. The hand-held X-ray gun picks out the arsenic, and the gold is pretty predominantly associated with the arsenic. When you get high level of arsenic, plus 10,000 parts per million, you’re looking in the 3–5 grams per ton. Gowest Golld spent a little bit of time over the summer going through some of the old core, and we found core outside of our resource that contained gold that really had never been analyzed. Again, our gold is fully disseminated. It’s not easy to see by the naked eye, and again, things we have learned now being underground has changed the way we view it, which is not really uncommon once you go underground, and has afforded us an opportunity that we think will be able to add ounces to Bradshaw itself and help us grow towards the 100,000-ounce mark. Maurice Jackson: Moving on to Phase 3. Talk to us about Blue Sky exploration and potential. Greg Romain: Gowest Gold has approximately 110 square kilometers of land located on the Pipestone Fault. We have about 25 kilometers of property on the Pipestone Fault itself, which we are seeing in addition to people that are outside Gowest Gold that have come by to look at, and it think that we are just sitting on the tip of the iceberg, and that it really lends itself to a much greater potential. In addition, Gowest Gold has completed quite a bit of geophysics, IP surveys, soil testing. And we have used the Bradshaw kind of as the marker, and we have done a lot of test work on Bradshaw. And now, we are testing all the other sites, and we are finding a lot of things light up and are similar to what we found on Bradshaw as the marker so to speak. So, we are pretty excited about the opportunities. Again, more work has to be done, but I think there’s a lot of interesting targets and opportunities that present itself to grow outside of that call it the Bradshaw area that I talked about, the Roussain zone and the Sheridan zone. I think as you move away, there’s going to be a lot more opportunities. Just south of Bradshaw, the previous San Gold had a company called SGX, which was its exploration company up in Timmins. And there’s a resource just south of Bradshaw that is very near to us. That deposit’s 50 meters of overburden, and they’ve recognized in the past that the only way they’ll get to it is through Bradshaw. Bradshaw just happens that there’s a large outcrop, and it’s the only outcrop of that size in the area. It’s really flat, bog-type situation. And on the Pipestone Fault, if you follow it further east, you’ve got a number of other deposits down at that end of it, which Kirkland Lake has the Taylor Mine and there’s the old Black Fox mine. So, there’s lots of opportunities on the Pipestone Fault. It’s just that where we are there’s lots of overburden, and it was people’s last thoughts. But obviously, it’s not our last thought. It’s such a profit center for us. Maurice Jackson: Talk to us about CSR. What type of relationship does Gowest Gold have with the community? Greg Romain: As I mentioned at the top, I was born and raised in Timmins. I still have family in Timmins, lots of family in Timmins, and I have a very good relationship with the city of Timmins. I have a very good relationship with the First Nation groups. I’ve worked with them for the last eight, nine years, very closely. They’ve been very forthcoming and very proactive and very supportive of what we are doing. Everywhere from the city of Timmins through the Mining School, we have hired students in the summertime, and even there’s a new mayor who’s just taken over. There was an election recently, but even the past mayor was a mining-friendly mayor, and I always had great support from the city and all the community. Maurice Jackson: Greg, as things come to fruition here, talk to us about the community and how many people will be gainfully employed here. 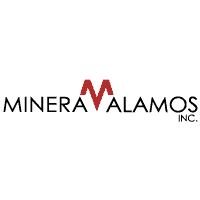 Greg Romain: Well, we expect once the mine gets up and running to what’s called the 50,000 ounce per year, phase one approach, we look to employ probably 70 to 80 people, possibly a few more. That’s just up in the Timmins area. There’d be a few more probably at corporate, but if we can get a mill built in Timmins, then you’re looking at another 20 to 30 people as well. So, all told, you’re probably looking at 100 people getting being employed up in the area, which is significant for the town. I can tell you when I’m back in Timmins, and people bump into me, they’re rooting for us because they all know about the big players and the big guys. But as I said to you, it’s been 25 years since anything’s been built from a greenfield. We have lots of supporters, and people want to see this happen. So, it keeps me excited to know that the community’s behind it. 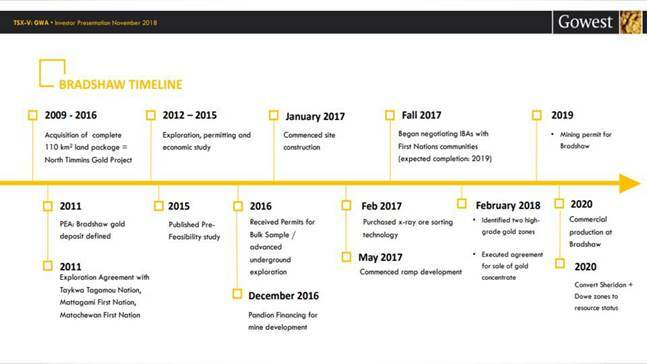 Maurice Jackson: Before we discussed the management team, are there any reversionary interests or royalties on the North Timmins Gold Project? Greg Romain: There are a few small royalties on the North Timmins Gold Project, but on Bradshaw itself, on the 100%-owned Bradshaw, there’s only a 1% royalty currently with Sandstorm. Maurice Jackson: Are there any redundant assets such as patent mining claims? Greg Romain: No, there are not. Maurice Jackson: Sir, we have covered a lot of ground. Let’s conduct a brief recap. Greg Romain: Gowest has enough ground to host multiple mines. We are targeting a near-mine exploration, and we are in striking distance of building the next new gold mine in Timmins. The Bradshaw Deposit has all the earmarks of the historical mines in Timmins. 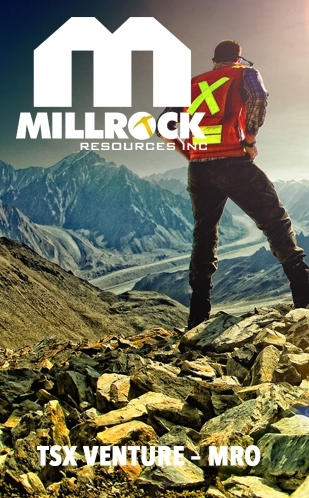 We have a large, large land position, and it’s situated in a world-class mining camp with great infrastructure. Maurice Jackson: Switching gears, I learned from some of the most surely successful in the industry, from Rick Rule, Doug Casey, Jayant Bhandari, Mickey Fulp, and Bob Moriarty, that the people running the business are equally if not more important than the latent material in the ground. 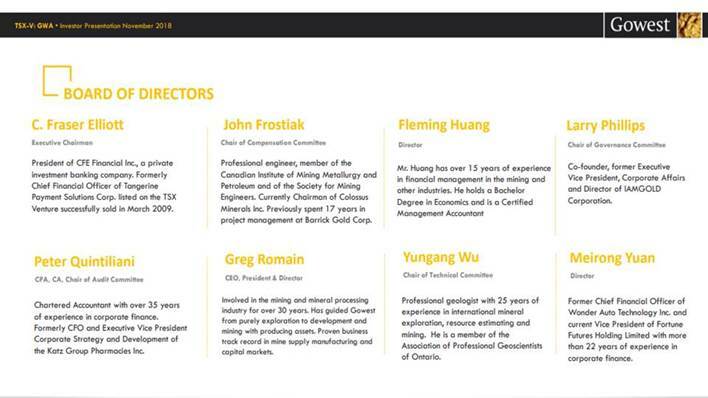 Mr. Romain, please introduce us to your Board of Directors and management team and the unique skillsets they bring to Gowest Gold. Greg Romain: When I took over Gowest, the Board at the time had been there a long time, and they stated, “Greg, do what you want with the Board. Change it the way you see fit.” What I’ve always tried to do when I’ve run a company is get people on the Board that I’m not looking for people just to agree with me all the time. I’m looking for people to challenge me, and I look for people with different skillsets. And fortunately, I’ve been able to do that here. A few names, Fraser Elliott, the chairman, he’s been involved in a lot of different financings and understands the business quite well. John Frostiak retired from Barrick, but he was involved in building the autoclaves for Placer Dome up at Red Lake, a very well-known, a very technically sound individual. Larry Phillips was a co-founder of IAMGOLD, which most people up there will know IAMGOLD. We also have Yungang Wu. He’s one of the representatives because one of our shareholders is out of China, and they own 23% of Gowest. Yungang was the fellow that introduced me to the folks in China, but he’s also a geologist. He QP’d several resources up in the Timmins Camp, including Temex, which currently is owned by Lake Shore or owned by Tahoe-Lake Shore operations. As well as I’ve got some really great mining people and technical people, and Greg Hart was underground mine manager for the operations for Goldcorp up in the Porcupine Camp in Timmins. Garth’s worked on a number of projects. He’s a metallurgical engineer, very sound, as well as Jeremy, who was involved with a number of discoveries and who heads up our director of explorations. So, we have got a really sound team that are a great skillset that have been passionate, and they’ve invested and have been pushing this project forward with me. Maurice Jackson: Tell us about Greg Romain. What makes him qualified for the task at hand? Greg Romain: I don’t like talking about myself because in my view, it’s not about me. It’s about the people around me. It’s the people that make it happen. I equate myself as general manager or a coach. When you bring the best people, you give them the tools, and let them go. I’m a person who perseveres, and I never give up. A lot of people in my position would be easily give up trying to build a new mine from a greenfield, and as you know, there’s very few that do it. I think that’s what qualifies me. Janet and I, who was the CFO, ran Norcast, which was a manufacturer of consumable products for the mining industry, and we were very successful at that and taking it public as an income trust. It’s selling it again, so we have been through it. We understand things, and again, it’s keeping people motivated and surround yourself with the best people. Fortunately, through my career, I’ve gotten to know a lot of great people, and they’ve all come back to try and help push this project forward. Maurice Jackson: Tell us about your capital structure. Greg Romain: Currently, we have about 370 million shares outstanding. We have 27 million warrants outstanding with the average price at about a quarter. We have about 12 million options at about 11 cents on average. Fully diluted, we are about 410 million in shares. Our largest shareholder’s out of China, a private company called Fortune Future. It owns approximately 23%, along with management that owns about 11% and other insiders, including insiders, we are probably about 41% of the company. Our trading range when we are up about 52-week high of 20 cents, and we are floating around in the four or three and a half cent mark right now. So, our market cap is hovering around a $15 million-dollar mark. Again, a big part of that is when we announced that the definitive agreement was going to move aside, and then we had to go and start over again on the processing side. So, that really impacted us, with the exception of cash, which we are working on now, I think we have a great opportunity here at Gowest. Maurice Jackson: Let’s discuss some numbers. How much cash or cash equivalents do you have? Greg Romain: Right now, we don’t have a lot of cash in the bank, and we are out doing a raise. We announced up to $5 million, plus our largest shareholders are visiting next week as well. Plus, we are looking at other strategic options to move the project forward from a funding perspective. Maurice Jackson: Talk to us about past cash flow distribution. Greg Romain: We have got about $8.6 million of debt, and in that, it includes $3 million of convertible at our discretion. The money that we got that we have been using has been all going into the ground, has all been going into the development of Bradshaw. We have spent approximately $12 million on Bradshaw. We need another approximately CA$15 million to get us into full production is what our financial models look at today. Everything goes into the Bradshaw, and that’s been our focus. It hasn’t moved from that. Maurice Jackson: What is your current burn rate? Greg Romain: So, to answer that question, if we were operating without the glitch that we ran into, our burn rate from a corporate G&A perspective is about $120,000 a month on average. That’s from a corporate side. Right now, we are on call it care and maintenance. Our burn rate’s about $200,000 to $250,000 a month. As I mentioned, we are underground, so we are trying to sustain and keep things dewatered while we work our way through the financing piece now that we have got the mill to mill the ore.
Maurice Jackson: Are there any Change of Control Fees? Greg Romain: The only Change of Control Fees are in the lending agreement with our lenders that we owe US$5.6 million to, and then also, the CEO and CFO have employment contracts. Maurice Jackson: Gowest Gold conducted a prefeasibility study. When was this completed, and what gold price was used to determine the economics? Greg Romain: The PFS was completed in June 2015, and it was done at the gold price of US$1,200 and at an exchange rate of about a $1.30, I believe, $1.25, or 80 cents exchange rate to be exact. On that PFS, the NPV was about US$40 million. The initial capital was about $21 million. Sustaining capital was about $21 million. This is all U.S. dollars. The average gold production in the PFS was 40,500, but I just want to caution everybody. 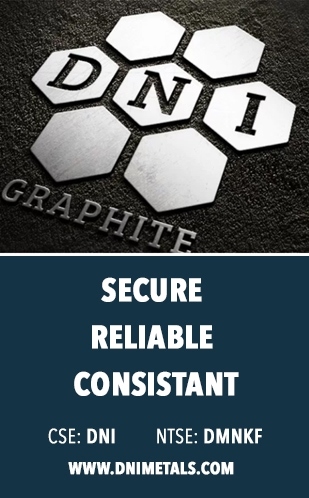 That includes the bulk sample in pre-production once we get into the production years, once we stabilize things here at 50,000 ounces per year. The life of mine operating costs were about US$821 per ounce, and the all-in sustaining cost was about $891 per ounce. So, the IRR was 27%. The life of mine was eight and a half years. This was 2015. We have been underground. We have done a lot of work since. But the folks that provided us with some of the funding out in New York, obviously, we have done a lot more work that we just haven’t gone out and re-published a 43-101. But I can tell you that things are still looking positive from that aspect. Maurice Jackson: All right, sir. You survived the storm. Mr. Romain, multi-layered question. What is the next unanswered question for Gowest Gold? When should we expect results? And what determines success? Greg Romain: Results, pending financing, which we have hope to close on some financing within by the end of the year, and then close the balance of it early next year. We expect to start the bulk sample towards the beginning of the second quarter. We should expect to have the bulk sample done about six months after that. At the same time, we are hoping, again subject to financing, to do a little more in-field drilling and then short some of the zones. And then, by the end of the year, come out with a new, updated resource along with plans to get us into production. Final plans, I’m referring, that we expect to have permits by then, so I think that’ll be the success. That’ll be the success if by this time next year, you and I are speaking again, and we can say, “We completed the bulk sample. Here’s all the great news, and we are now headed into full production.” That to me will be success. Maurice Jackson: What keeps management up at night that we don’t know about? Greg Romain: One of the biggest things that frustrates me as a CEO of a publicly traded company is that you can’t always put out news releases because sometimes you’re working on things. Until it’s completed, there’s not much you can say. For myself, and the chairman and the CFO and a lot of the technical people, we are all shareholders in the company. We have bought all along. Last year, I purchased stock in the $0.20s, and most recently, I bought stock at 8 cents. So, it’s painful, but at the same time, we are going to put out news when it’s justified, and it makes sense. We are in a space that’s a very difficult space, and people under a lot of pressure. I understand that shareholders want to hear what’s going on. They want news. I think in our case, I may be a conservative kind of guy, right, but I’m not just going to pump something for the sake of pumping because I just think that is wrong. But I will tell the truth, and I will give you the news when I know what the news is. Management would love to be out buying stock right now in the market, but at the same time, there’s a lot of things we are working on that we have got to be careful that we are not off-side as well, right? So, it’s a fine balance, and it’s one that keeps me up. The communication and how we can do a better job, and hopefully, as we move forward, we’ll continue to put out the releases in a timely manner that meet expectations of all shareholders. But at the same time, it’s information that’s going to be meaningful to the reader. I can’t just put out information for the sake of putting out information. Maurice Jackson: If you would, sir, you referenced a financing opportunity. Share the specifics with us. Greg Romain: Yes. We announced about a week or so ago that we are raising up to $5 million by way of a non-brokered, private placement, and it’s cheap. It’s at $0.05, and I think it’s a great deal for people. At a nickel with a two-year warrant at 7 cents, and these are all Canadian dollars. Maurice Jackson: What question did I forget to ask? Greg Romain: You’ve covered just about all the bases, and hopefully, I’ve been able to explain things clearly enough to the readers out there and, hopefully, get to come back sometime soon to give you an update. Hopefully, in a few months when we get some feed into the mill. Maurice Jackson: Greg, for someone listening that wants to get more information on Gowest Gold, please share the website address. Greg Romain: The website address is www.gowestgold.com. 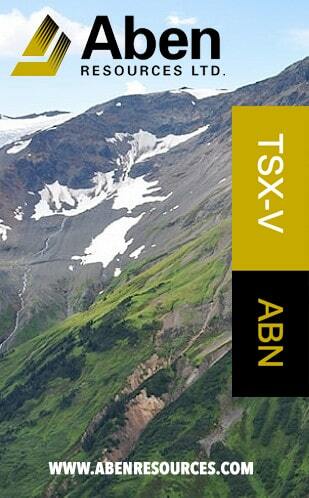 Maurice Jackson: And as a reminder, Gowest Gold trades on the TSX.V: GWA, and on the OTC: GWSAF. For direct inquiries, please contact Greg Romain at (416) 363-1210. He may also be reached at info@gowestgold.com. Last but not least, please visit our website www.provenandprobable.com where we interview the most respected names in the natural resource space. You may reach us at contact@provenandprobable.com. Greg Romain of Gowest Gold, thank you for joining us today on Proven and Probable. Maurice Jackson is the founder of Proven and Probable, a site that aims to enrich its subscribers through education in precious metals and junior mining companies that will enrich the world. 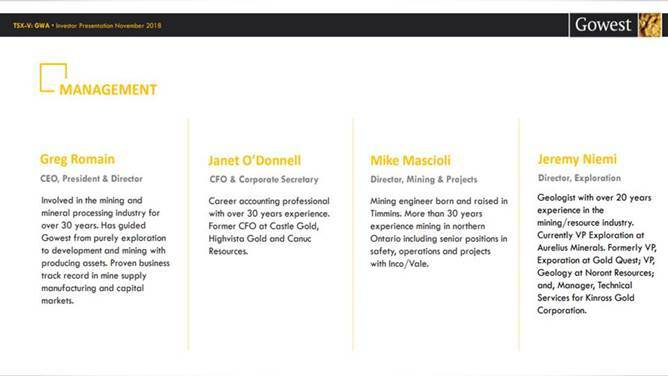 1) Greg Romain: I, or members of my immediate household or family, own shares of the following companies mentioned in this article: Gowest Gold. I personally am, or members of my immediate household or family are, paid by the following companies mentioned in this article: Gowest Gold. 2) Maurice Jackson: I, or members of my immediate household or family, own shares of the following companies mentioned in this article: None. I personally am, or members of my immediate household or family are, paid by the following companies mentioned in this article: None. My company has a financial relationship with the following companies mentioned in this article: None. Proven and Probable disclosures are listed below. 3) The following companies mentioned in this article are billboard sponsors of Streetwise Reports: None. Click herefor important disclosures about sponsor fees. 4) Statements and opinions expressed are the opinions of the author and not of Streetwise Reports or its officers. The author is wholly responsible for the validity of the statements. The author was not paid by Streetwise Reports for this article. Streetwise Reports was not paid by the author to publish or syndicate this article. The information provided above is for informational purposes only and is not a recommendation to buy or sell any security. Streetwise Reports requires contributing authors to disclose any shareholdings in, or economic relationships with, companies that they write about. Streetwise Reports relies upon the authors to accurately provide this information and Streetwise Reports has no means of verifying its accuracy. 6) From time to time, Streetwise Reports LLC and its directors, officers, employees or members of their families, as well as persons interviewed for articles and interviews on the site, may have a long or short position in securities mentioned. Directors, officers, employees or members of their immediate families are prohibited from making purchases and/or sales of those securities in the open market or otherwise from the time of the interview or the decision to write an article until three business days after the publication of the interview or article. The foregoing prohibition does not apply to articles that in substance only restate previously published company releases. Proven and Probable LLC receives financial compensation from its sponsors. The compensation is used is to fund both sponsor-specific activities and general report activities, website, and general and administrative costs. Sponsor-specific activities may include aggregating content and publishing that content on the Proven and Probable website, creating and maintaining company landing pages, interviewing key management, posting a banner/billboard, and/or issuing press releases. The fees also cover the costs for Proven and Probable to publish sector-specific information on our site, and also to create content by interviewing experts in the sector. Monthly sponsorship fees range from $1,000 to $4,000 per month. 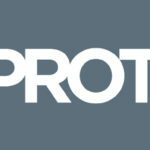 Proven and Probable LLC does accept stock for payment of sponsorship fees. Sponsor pages may be considered advertising for the purposes of 18 U.S.C. 1734. The Information presented in Proven and Probable is provided for educational and informational purposes only, without any express or implied warranty of any kind, including warranties of accuracy, completeness, or fitness for any particular purpose. The Information contained in or provided from or through this forum is not intended to be and does not constitute financial advice, investment advice, trading advice or any other advice. The Information on this forum and provided from or through this forum is general in nature and is not specific to you the User or anyone else. You should not make any decision, financial, investments, trading or otherwise, based on any of the information presented on this forum without undertaking independent due diligence and consultation with a professional broker or competent financial advisor. You understand that you are using any and all Information available on or through this forum at your own risk. This entry was posted in Exclusive Interviews, Precious Metals on December 19, 2018 by admin.